Start off your visit on the 1st (Tue): buy something for everyone on your list at Faneuil Hall Marketplace. Keep things going the next day: explore and take pictures at Fenway Park, admire the masterpieces at Museum of Fine Arts, and then pause for some serene contemplation at Trinity Church. To see ratings, reviews, photos, and more tourist information, use the Boston sightseeing planner. Timisoara, Romania to Boston is an approximately 14.5-hour flight. The time zone difference when traveling from Timisoara to Boston is minus 7 hours. Plan for somewhat warmer nights when traveling from Timisoara in October since evenings lows in Boston dip to 11°C. Wrap up your sightseeing on the 3rd (Thu) early enough to ride a ferry to Provincetown. Change things up with these side-trips from Provincetown: Edward Gorey House (in Yarmouth Port), Chatham Marconi Maritime Center (in North Chatham) and Heritage Museums & Gardens (in Sandwich). There's still lots to do: tour the pleasant surroundings at Cape Cod National Seashore, pause for some photo ops at Pilgrim Monument & Provincetown Museum, browse the collection at Provincetown Library, and take a leisurely stroll along MacMillan Wharf. To see maps, other places to visit, photos, and other tourist information, you can read our Provincetown route website . Ride a ferry from Boston to Provincetown in 1.5 hours. Alternatively, you can fly; or drive. In October, daily temperatures in Provincetown can reach 20°C, while at night they dip to 11°C. Cap off your sightseeing on the 6th (Sun) early enough to go by car to Falmouth. Falmouth is a town in Barnstable County, Massachusetts, United States; Barnstable County is coextensive with Cape Cod. Kick off your visit on the 7th (Mon): engage your brain at Sandwich Glass Museum, tour the pleasant surroundings at Shining Sea Bikeway, then explore the world behind art at Highfield Hall & Gardens, then admire all the interesting features of Cornelia Carey Sanctuary (The Knob), and finally admire the natural beauty at Spohr Gardens. To see traveler tips, other places to visit, maps, and more tourist information, you can read our Falmouth road trip planning app . Getting from Provincetown to Falmouth by car takes about 2 hours. Other options: take a bus. In October, plan for daily highs up to 20°C, and evening lows to 9°C. Finish your sightseeing early on the 7th (Mon) to allow enough time to drive to New York City. New York City is known for museums, nightlife, shopping, historic sites, and parks. Your plan includes some of its best attractions: explore and take pictures at Central Park, enjoy breathtaking views from Top of the Rock, take a stroll through Times Square, and go for a walk through The High Line. For other places to visit, traveler tips, maps, and tourist information, refer to the New York City road trip site . Traveling by car from Falmouth to New York City takes 5 hours. Alternatively, you can do a combination of bus and flight; or do a combination of bus and flight. Traveling from Falmouth in October, things will get somewhat warmer in New York City: highs are around 24°C and lows about 16°C. Finish your sightseeing early on the 11th (Fri) to allow enough time to travel to Washington DC. Washington DC is known for museums, historic sites, nightlife, zoos & aquariums, and parks. Your plan includes some of its best attractions: examine the collection at National Air and Space Museum, get a new perspective on nature at Smithsonian National Museum of Natural History, take an in-depth tour of United States Holocaust Memorial Museum, and ponder the world of politics at United States Capitol. For traveler tips, other places to visit, more things to do, and other tourist information, you can read our Washington DC trip planner. Traveling by flight from New York City to Washington DC takes 3.5 hours. Alternatively, you can take a train; or drive. In October, daytime highs in Washington DC are 25°C, while nighttime lows are 14°C. Wrap up your sightseeing on the 14th (Mon) early enough to travel to Key West. On the 15th (Tue), see the interesting displays at The Ernest Hemingway Home and Museum, then identify plant and animal life at Key West Butterfly & Nature Conservatory, then view the masterpieces at Alan S. Maltz Gallery, and finally glide peacefully along the water with some of the best stand-up paddleboarding in the area. Get ready for a full day of sightseeing on the next day: steep yourself in history at Truman Little White House, stop by Key West Treasure Chest, then explore and take pictures at Key West Garden Club, and finally get up close to creatures of the deep with a dolphin and whale watching tour. To find maps, traveler tips, and other tourist information, read our Key West trip itinerary builder . Traveling by flight from Washington DC to Key West takes 5 hours. Alternatively, you can do a combination of train and flight; or drive. Traveling from Washington DC in October, expect nights in Key West to be much hotter, around 29°C, while days are a bit warmer, around 35°C. Wrap up your sightseeing on the 16th (Wed) early enough to travel to Orlando. 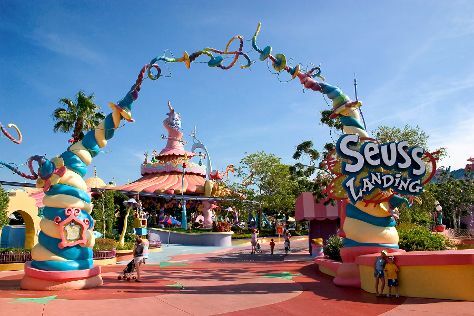 Pack the 17th (Thu) with family-friendly diversions at Universal's Islands of Adventure. Pack the 19th (Sat) with family-friendly diversions at Universal Orlando Resort. It doesn't end there: get in on the family fun at Walt Disney World Resort. For reviews, ratings, other places to visit, and more tourist information, read our Orlando attractions tool . You can fly from Key West to Orlando in 4.5 hours. Other options are to drive; or take a bus. Traveling from Key West in October, expect slightly colder with lows of 24°C in Orlando. Wrap up your sightseeing on the 19th (Sat) early enough to travel back home.